With the introduction of HHCAdvantage, New York City Health and Hospitals Corporation (HHC) has entered into a new era of patient care - by offering real-time access and support for physicians who treat patients in our community. As one of the many service benefits offered by HHC Connectx, HHC’s Community Provider Services Program, HHCAdvantage is an easy-to-use web-based application designed to link community-based physicians and HHC facilities. This application offers greater convenience for referring physicians and their office staff, greater efficiencies for hospital staff in processing larger referral volumes, and insightful management reporting that will help to identify areas for further process improvement. By enabling providers to sign on and track their patients throughout the referral process and receive follow-up on their patients’ hospital visits, HHCAdvantage enhances the level of customer service offered to community providers and their patients. The reporting capability of HHCAdvantage will support routine and accurate tracking of your patients from initial referral request to treatment at our facilities to results/consult reports being returned back to your office. A referral management tool for you and your support staff. 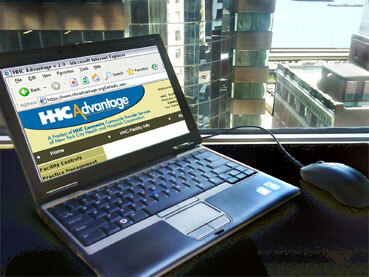 HHCAdvantage enhances the level of customer service that both you and our hospital will be able to offer your patient. Your patients will feel connected and appreciate being served.